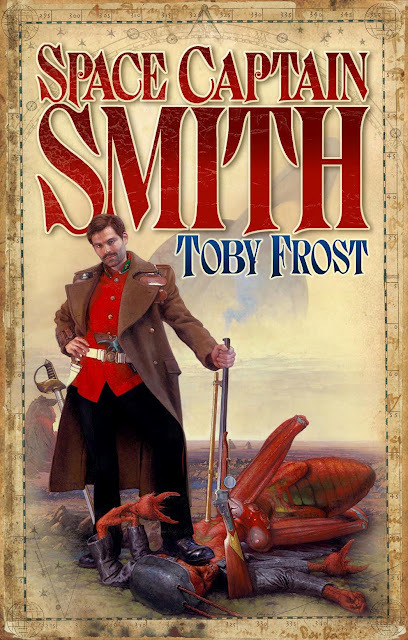 To our blog this week, I’m delighted to welcome Toby Frost, the comic mastermind behind the fabulous Space Captain Smith series. So Toby, how did you first get the idea for the Space Captain Smith series? It came from an email conversation with a friend of mine who was reading H.G. Wells at the time. I remember thinking that it would be entertaining to have Victorians landing on other planets and demanding gin and tea from the bemused inhabitants, and it all came from there. I already had a vague idea for Suruk the Slayer, and Polly Carveth was a good foil for both him and Smith. The other creatures of the Smith world seem to write themselves. Shortly afterwards, during a holiday in Cornwall, I awoke from a cider-fuelled dream muttering about constructing “the moon-ship”. After that, I just had to write the thing. What does an average writing day look like for you? I’m not sure I really have one. I do try to write every day, but that’s about it. If I could, I’d simply write 9-5, but sadly the real world requires me to have a job, which is an annoying necessity. I’m lucky in that I don’t seem to have to be particularly in the mood to write, though, so I can just get on with it when the opportunity arises. Do you have a special writing talisman or a routine you like to follow when sitting down to write? Not really. I tend to listen to music whilst writing – I try to find something vaguely appropriate to listen to, but given what I write, that’s not always easy. A lot of my writing is done in the evenings with the assistance of wine. I once worked out that at least 2/3 of my work was done while I was legally unable to drive, which may explain quite a lot! What’s your preferred method of writing a novel – do you plan things in advance, or write by the seat of your pants? I used to operate very much by the seat of my pants, but I have discovered that planning really does help for me, so I leave the pants out of it as much as possible at the moment. I tend to find that ideas stick in my head for a short while, and for a week or two I’ll be unable to think of anything else. It’s the ones that are still there after a month which end up being used. I’m not a natural at plotting stories, so I have learned the value of working out what’s going to happen in advance. It also means that if I’m having difficulties with one piece, I can skip forward a bit to something easier without losing the flow of the story. How did you go about creating the characters of Smith, Carveth and Suruk? And, do you use any celebrities or people you know as inspiration for them or any of your other characters? I’m not sure whether the three main characters came from, but I wanted a situation where, no matter who was talking, it would be possible for an argument to start. After all, comedy is all about tensions and contrast. Smith was inevitable, in a way, as he’s the sort of well-meaning, heroic person that the Space Empire tends to produce. Carveth is something of a reaction against that, as her main aim is to live as quietly and comfortably as possible. And Suruk is, well, he’s a homicidal maniac. An honourable maniac, as he’d be keen to stress, but still a maniac. With characters like that, arguments are easy to create, although preventing fatalities so far has been tricky. As to inspirations, I find archetypes more useful to work from than individual people. Suruk of course is a parody of every Noble Warrior Alien ever; similarly, Wainscott is a sort of crazed explorer/special forces type from somewhere between 1850-1950. That said there are a few characters who I imagine as real people, but they’re not that frequent. I could point to several TV presenters who look like Carveth, now I think of it! What was your journey to becoming a published author like? Like most published authors, I found it a lengthy and uneven road! For one thing, Space Captain Smith was a book I wrote for fun, whereas the serious novel I intended to make my name is still unpublished and unlikely to see the light of day at all. I was lucky to write Smith at the time when retro things and Steampunk were becoming popular, as well. However, what really helped me was a contest in the Telegraph for the first thousand words of a novel. I entered and got into the last fifty entrants (I think it’s still up on their website somewhere), and was able to tell that to the publishers. In short, anything on the CV that shows that you’re able to write the sort of book you’re trying to get published is good. What advice would you give those readers aspiring to getting a novel published? Firstly, keep trying to improve and learn more about writing. Good writing groups are about, as well as courses and some good web forums (you have to be a bit choosy). Hearing honest critique from people who don’t know you can be difficult, but is very useful even if you’re just deciding why you’re disagreeing with the points they make. Second, I would suggest entering competitions, writing articles and basically doing anything that will help you to seem like the kind of person who ought to be published. Whether that’s getting the research right or having a list of other published work, it can’t hurt. Don’t forget to do the writing itself, though. Third, always send in manuscripts, covering letter, synopses and so on as the publisher or agent requests. If they only want the first three chapters, only send those. Seen in purely statistically terms, the odds of getting published are terrible. However, once you remove the books that are badly written, wrongly submitted or just plain unsellable, the odds begin to look better. And finally, what are you working on at the moment, and when will we get to read it? At present, I’m working on a fourth Space Captain Smith story, as well as an unrelated, more serious, space adventure. I’m not sure when either of these will see print, but as soon as possible, preferably! Huge thanks to Toby for letting us grill him. Toby’s books: Space Captain Smith, God Emperor of Didcot, and Wrath of the Lemming Men are available from amazon, play.com and all good bookshops. They’re awesome, so we strongly recommend you check them out. ← Please, Don’t Tell It – Show Me. Excellent grilling! Thanks so much to Toby for participating. I love the Space Captain Smith novels. I love his 3 pieces of advice especially the ‘Don’t forget to write’ so valuable when it’s so easy to get caught up in creating your public profile. Great interview and a good insight into a working writer. I absolutely cannot have music on when i write though – i need silence! I do have to be in the mood though, which is a pain as I’m currently writing full-time. Again, wine helps – though I’m not sure my liver would agree. Founded in 2011. We are Nine.